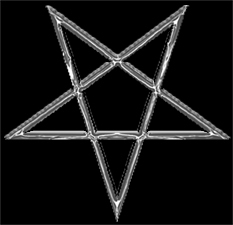 The Black Goat Cabal, which existed from 2003 to 2007, was an online-based network of Satanists who rejected dogma-based definitions of Satanism, opposing especially (1) the idea that LaVeyans are the only true Satanists and (2) the idea (far more common outside the Satanist scene than within it) that the only true Satanists are close-to-pure reverse Christians. Our aim was to raise the public visibility of those law-abiding forms of Satanism which do not fit either of the above two categories, and which preferably also have more to offer in terms of intellectual substance and/or a sane and well-developed system of occult practice. Unless otherwise noted, all contents copyright © 2003 Black Goat Cabal. All rights reserved. Chrome pentagram graphic courtesy of Walpurgis9's Hellish Graphics. This site maintained by Diane Vera on behalf of the Black Goat Cabal. Complaints and suggestions should be sent to Diane Vera. Views expressed on these pages are not necessarily those of D. Vera.